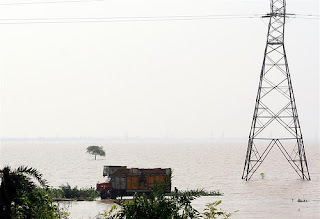 In the south this week, hundreds have been killed and millions left homeless by a flood so large that Andhra's Information Minister Geetha Reddy termed it a "possible maximum flood, which happens once in 10,000 years." The agricultural sector has not been spared either: the floods have already damaged at least 20% of India's corn crop.This comes on the heels of what government officials have already been calling the worst drought in 40 years. Obviously, officials have something to gain by emphasizing how severe these events are; doing so provides them some cover from critics who call into question our disaster preparedness systems. Of course, the critics are right: we should have been better prepared, especially after the the 2008 Bihar flood. Still, there is no denying the fact that the current flooding and drought are extraordinary events. It may even be that this is one of the worst floods in 10,000 years. But anyone who thinks it will take another 10,000 years before we experience another flood like this one is living in a fantasy world. The problem is that today's extraordinary weather is becoming increasingly... ordinary. There is a reason for this, and it's called climate change. There is a growing consensus that India's monsoons are already being affected by global warming: leading meteorologists and scientists have been piling on the evidence for this in recent months. Climate change is not only weakening our monsoons, but it is leading to increasing numbers of hazardous weather events, which account for many of the 150,000 deaths world-wide that the World Health Organization directly attributes to climate change every year. In spite of all this evidence, every so often I run across someone who maintains that climate change is not happening, or that it's not something to worry about. Those people remind me of the people who tell you smoking isn't really all that bad for you. 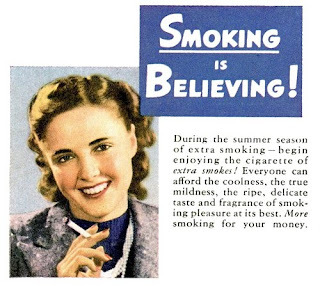 There is a reason why there are still a few people around who believe this: the tobacco industry has spent huge amounts of money over the years promoting this idea. They can no longer get away with saying things like, "More doctors smoke Camels" or "not one single case of throat irritation due to smoking"; now their tactics are more subtle, though their intentions are largely the same: confuse, mislead, sell (cigarettes). Big Oil learned a lot from the tobacco companies. For example, they learned that since the modern media loves to look "balanced," often all you need is one or two skeptical voices in order to call an otherwise well-accepted idea into question. The tobacco industry paid professional "experts" to do their dirty work; it should come as no surprise that the oil industry has been doing the same. Many of the climate skeptics we hear about are, in fact, on the payroll of multinational oil companies. In fact, if you look at the last link, you will see that Fredrick Seitz, sometimes called the "granddaddy of global warming skeptics," actually made a lot of money working for the tobacco industry before he started taking money from the oil industry. It wasn't a hard transition, since the goals of multinational oil companies are so similar to those of the tobacco industry: confuse, mislead, sell (oil)! Now I want to be clear. No one can tell you for certain that our current drought or the floods in the south are the direct result of climate change, just as nobody can tell you for certain that the lung cancer that killed your friend's uncle was the direct result of the 20 cigarettes he smoked daily. It could have been the Delhi pollution or his bad genes. You never know. But any doctor will tell you that if uncles all over Delhi keep smoking a pack a day, it is only realistic to assume that a certain number of them will die of lung cancer. A realistic view of extreme weather is likewise simple: if the world keeps warming the way scientists think it will, droughts like this will happen a lot more frequently than every 40 years; and it will not be 10,000 years before we have another flood like the one that is wreaking havoc this week in the south. Take a minute, look look at the news and think about that. So what should be done? Well, it should be obvious that we need to rethink what we mean by national security. We need to de-prioritize big budget programs like nuclear weapons and high-tech bombers, since, as we have argued previously, these programs are more about national pride than national protection. Of course, our armed forces need to be able to defend our borders and protect us from terrorism. But they should also become the best-trained disaster relief providers in the world. That would be something to be proud of--and it would save lives. Speaking of "national pride projects" we should use the billion dollars or more that we are currently spending on our space program for more useful things. India doesn't really need a base on the moon or a space ship for space tourists.We need to point our best brains in other directions: the search for sustainable energy sources and agriculture that is drought and flood resistant. Without power or farms, what good is a ticket to the moon? It won't pump our water; it won't feed our families. Finally, we need to shame the US and other European countries into taking meaningful action on climate change. We can no longer afford to politely beg for scraps from developed world; those scraps will never be enough. We are not asking for charity, only justice. We did not cause this problem: the vast majority of the carbon in the earth's atmosphere was made in the US and Europe. Those countries need to cut their emissions drastically in order to leave us the room we need to develop; and they need to provide us tangible aid as we respond to the crisis that they created. We should not expect these things to be easy, nor will they happen over night. Still, we must be clear about what needs to be done. If we do not take aggressive steps in the right direction soon, we will be left reeling as we struggle to respond to an ever-worsening series of extreme weather events, inadequate disaster management efforts, failing crops, inflation, more farmer suicides, and even famine. In other words, realistically speaking, we don't really have any choice but to look the problem in the eye and get to work. A guest you are, Madman! And reap what you sow, Man! Set that messy house straight! Else before you end unfolds. You're so right! Misinformation is the name of the game for oil companies. I've come to realize that powerful lobbying is so prevalent in the US that it dwarfs corruption in a country like India. Bribery taken to new heights is called lobbying! The US businesses even want to challenge climate change in court - can one even believe it? And you're also right about justice. One way in which developed countries can make amends is through technology transfer. Let us help ourselves. But they don't want to do that either. Something somewhere has to give. Looking forward to Copenhagen eagerly. I think your post is the first poem to grace the dhaba. It is stunning. I want to write all the reasons I like it, but this is not a writer's workshop, so I'll refrain. Can I just say, I am glad to be reminded of one of the many reasons why poetry matters: in it's compression, it can achieve a power that prose cannot match. In any case, we've broken the threshholds; is it too late to set that messy house straight? @Bhagwad--We cross-posted; i missed this until this morning. I look forward to looking at your links. Your point about "legal corruption" in the US is an important one. Money talks, no? In many languages! "Finally, we need to shame the US and other European countries into taking meaningful action on climate change. We can no longer afford to politely beg for scraps from developed world; those scraps will never be enough. We are not asking for charity, only justice. We did not cause this problem: the vast majority of the carbon in the earth's atmosphere was made in the US and Europe. Those countries need to cut their emissions drastically in order to leave us the room we need to develop; and they need to provide us tangible aid as we respond to the crisis that they created." But this is precisely what India and a host of other countries have tried and failed to do this last decade. The Kyoto Protocol is finally a weak instrument that works around the issue of reducing emissions, and I am rather pessimistic of what Copenhagen will serve up, other than more dogfights. The US is unlikely to get of its high horse, the UK seems set on undoing what little it achieved these last te years. But the bigger tragedy in India is our utter lnability at implementation. We come up with very decent legislation - our environment laws are among the most comprehensive, so is our National Climate Change Action Plan , and we do recognize the need to stress on adaptation strategies to survive the irreversible effects of climate change. After that, nothing. Climate change in our region will also bring India a huge influx of environmental refugees - and f our track record with solving domestic regional conflicts is anything to go by, God help our sorry messy house then. Technology transfer is rarely meaningful, especially if influential donors like the US are keener on nuclear energy or carbon capture ad transfer than anything conducive to Indian conditions. Couldn't access the link from Bhagwad, is it the cute one about how carbon dioxide is good for the planet? @wordjunkie--you raise a lot of important points. It's profoundly depressing. I don't have a lot of faith in Copenhagen. I'm afraid that things will move slowly until/unless huge masses of people begin to see this as a life and death issue and mobilize. It's not happening now. It will also have to happen in the US and Europe. (Bhagwad's link,btw, was re: some US companies are suing somebody to prove that climate change isn't happening or some such nonsense...). The problem is the the US and Europe really are the lion's share of the problem. Our contribution now is small. China is producing a lot--but so much of that is because they are producing goods consumed in the rest of the world--in the US and Europe, mostly. If we want development, however, we'll need to get moving on the renewables. BTW, I think you are right about the refugees. I can't imagine the US or UK saying to millions of refugees from Bangladesh, "Welcome, come live here!" So they will come here once their land begins to go under. I read somewhere that Hurricane Katrina in2006 was a watershed of sorts in the US. It showed the incompetence of the Bush administration, and it called into question the American national security priorities and raised the questions re: climate change and weather. Bush is gone, but I don't think there's been a change in the fundamental attitude of the US toward climate change. Doesn't look like it from here. In any case, it seems to me that our weather this year is a problem not just because of inadequate response systems, but because it really is a sign of what's a head. And it's terrifying. At the point when floods happen, waters bring with them sewage matters, trash and all kind of flotsam and jetsam which could be a perfect home for germs and microbes.